Draft: 2004, Anaheim Angels, 18th rd. Married, wife's name is Maile...The couple has a daughter, Morgan...2004 graduate of Villa Park (CA) HS...Earned high school All-American honors as a senior after hitting .425 and going 10-2 with a 2.20 ERA...Named a second team AllAmerican as a junior in 2003...Committed to play baseball at the University of Southern California before signing with the Angels... Selected by the Angels in the 18th round of the 2004 First-Year Player Draft…Signed by Tim Corcoran...Participates in the annual BARCS Pet Calendar. Had two hitting streaks of 12 games (6/16-28 and 7/27-8/10); matched his career-high (8/29-9/10/15 while with SEA)..Recorded a season-high four hits on 5/22 at CWS; his eighth career four-hit game...Hit .313 (25-for-80) in 22 games playing the field (19G - RF and 3G - 1B), compared to hitting .242 (60-for-248) in 65 games as the designated hitter...Hit .284 (27-for-95) with five home runs and 16 RBI in 26 games following the All-Star Break...Batted .298 (37-for-124) and 10 home runs with nobody out...Recorded his 13th and 14th career multi-homer games (7/1 vs. LAA and 8/5 at TEX)...Homered in back-to-back games on both 6/20-21 and 6/23-24...Hit his second career pinch-hit home run on 6/24 at ATL; his first came on 9/27/15 at LAA...Slugged his fifth career grand slam in the first inning on 6/23 at ATL...Placed on the 10-day disabled list on 8/20 with right knee inflammation; transferred to the 60-day DL on 9/11 with right knee surgery...Made his season debut on 5/1 at LAA; was reinstated from the DL earlier that day (right quad strain)...Since 2012, his 189 home runs rank T-11th among active Major League hitters. Hit a walk-off solo home run on Opening Day (4/3 vs. TOR), his sixth career walk-off home run and first walk-off home run on Opening Day for the Orioles in club history...Recorded a season-long 10-game hitting streak from 7/2-7/15...Batted .306 (11-for-36) with two doubles, four home runs, nine runs scored, eight RBI, and five walks...Batted .324 (36-for-111) with six doubles, five home runs and 15 RBI in the month of May...Hit safely in 20-of-28 in the month...Hit a walk-off single in the 12 th inning on 9/3/17 vs. TOR, his fourth walk-off hit of the season (4/3 vs. TOR, 5/9 vs. WSH, & 6/6 vs. PIT); his ninth career walk-off hit...Ranked fourth on the Orioles with 21 RBI in the seventh inning or later...Was fifth on the team with 37 multi-hit games...Reinstated from the 10-day DL on 8/9/17...Placed on the 10-day DL on 7/31/17 (retroactive to 7/30; right rib cage strain)...Recorded his third career game of at least three runs scored and at least three RBI on 7/14 vs. CHC (2-for-3, one home run, three runs, three RBI, two walks)...Left the 7/4 game at MIL with a left calf contusion in the top of the sixth inning...Walked a career-high three times on 6/7 vs. PIT...Slugged his fourth career grand slam on 4/28 at NYY (top of the sixth inning off RHP Bryan Mitchell)...Since 2012, his 172 home runs rank 11th among active Major League hitters. Led the majors with 47 home runs and ranked tied for eighth with 108 RBI...Earned his frst career Silver Slugger Award as one of three American League outfelders to receive the honor...Earned the Players Choice Award for American League Comeback Player of the Year...Selected to the 2016 All-Star Game, his second career All-Star selection (also 2012 with LAA)...Went 0-for-1 as a defensive replacement in left feld (entered game in sixth inning)...Competed in the Home Run Derby as the No. 1 seed, defeating No. 8 seed Corey Seager (LAD) in the frst round, 16-15...Fell to No. 5 seed and eventual champion Giancarlo Stanton (MIA), 17-14, in the semifnals...Was one of four Orioles to homer in the frst inning on 8.19 vs. HOU before the Astros recorded an out (frst time in Major League history since 1900, according to STATS, LLC.)... Homered in three straight games, 7/6-9, (four home runs in that span), his longest such streak since a career-high tying four-game stretch from 4/3-6/14...His 28 home runs before the All-Star break were tied for third in Orioles history...Notched his 12th career multi-home run game (ffth of the season) on 7.6 at LAD...His 47 home runs and 108 RBI set new career highs...Since 2012, his 149 home runs rank 10th in the majors...Became the ffth-fastest Oriole to reach the 40-home run plateau (129 G)...C. Davis (109 G, 2013), J. Gentile (119 G, 1961), B. Anderson (120 G, 1996), and F. Robinson (123 G, 1966)...Became the third player in club history to post a 40-home run season in his frst year with the club (Nelson Cruz, 40 HR in 2014; Frank Robinson, 49 HR in 1966)...Led Orioles outfelders with 10 assists...Named Co-AL Player of the Week for the period ending 4.17, batting .320..346..960 with fve home runs and 11 RBI...Became the frst Orioles player to homer twice in the same inning on 4.15 at TE;...Hit a two-run home run and three-run home run in the seventh inning...Had an 11-game hitting streak from 4/14-26 in which he hit .349 (15-for-43) with two doubles, three home runs, and 12 RBI...Was the starting designated hitter in the 2016 AL Wild Card Game at TOR (1-for-4, 1 HR, 1 R, 2 RBI)...Homered for his frst career postseason hit in the fourth inning. Finished second on the team with 14 home runs and third with 61 RBI in his first season with Arizona, batting .235 (77-for-328) over 88 games...Averaged a career-best 5.38 at-bats per RBI, down from 6.20 in 2013…his 4.07 plate appearances-per-strikeout ratio was his best since 2011 (4.78)...Appeared in 43 games at first base and 41 in left field...Of his 61 RBI, 42 came after the All-Star Break, tied for eighth most in the NL (also: Giancarlo Stanton)...On 15-day disabled list from April 22-July 11 with a stress fracture in his left foot...Totaled 10 homers and 41 RBI vs. NL West opponents…41 RBI were fourth most in the Majors...Tied a club record by homering in 4-straight games from April 3-6 for the second time in his career...Set a career high with 7 home runs in March/April, tied for the most by a D-back since Chris Young in 2011...Hit his first home run with the D-backs on March 23 vs. Dodgers @ Sydney Cricket Ground...Collected his 100th career home run on April 6 @ Rockies and his 300th career RBI on April 13 vs. Dodgers...Reached base safely in 17 straight games from Aug. 20-Sept. 7, the longest single-season streak of his career...22 RBI in Sept. were his second most in a single month (27 in June 2012). Established career highs in home runs, runs scored, RBI and games played in his third season with the Angels, hitting .234 (145-for-620) with 30 doubles, 34 home runs, 100 RBI and 85 runs scored in 159 games…first Angel to appear in at least 159 games since Garret Anderson in 2003 (also 159)... Sixth Angel with 30 home runs and 100 RBI in a season before turning 28, joining Wally Joyner, Tim Salmon, Jim Edmonds, Troy Glaus and Kendry Morales... Ranked among AL leaders in home runs (T-4th) and RBI (8th, 100)…also ranked fifth in the AL with a club-record 184 strikeouts... Hit at least 20 fi rst-half home runs for second straight season, the third Angel to accomplish the feat (also Joyner in 1986-87 and Leon Wagner in 1962-63)... Reached base safely in 23 straight games to start a season, the third-longest streak in franchise history... Went 5-for-5 with 3 doubles, a home run and 5 runs scored on Sept. 10 @ Blue Jays, becoming the fi rst player in club history with at least 5 hits and 5 runs in a game… was the fi rst player with 5 hits and 5 runs since Pirates' Andrew McCutchen on May 10, 2010 @ Cubs…tied a franchise record with fi ve runs scored (third time) and 4 extra-base hits (10th). Completed sophomore season batting .268 (146-for-544) with 32 home runs and 95 RBIs...Improved in nearly every offensive category over his rookie season...Became first Halo with 30 HRs in a season since K. Morales in 2009 (34)...Led club with 32 home runs and finished second on club in RBIs, trailing only Pujols' 105...Hit .306 (88-for-288) with 22 home runs and 57 RBIs in first half...Only four other Angels in club history hit more homers before All-Star break (G. Anderson - 26 in 2000, T. Glaus - 25 in 2000, M. Vaughn - 23 in 2000 and D. Baylor - 23 in 1979)...Hit .227 (58-for-256) with 10 HRs after break...Named to his first career All-Star Game...Went 0-for-2 in Midsummer Classic...Also took part in first career Home Run Derby, hitting a total of 13 long balls and finishing third overall...Was fifth Angel to participate in Derby and first since Vlad Guerrero in 2007...According to Elias, was first sophomore to reach 30-HR mark in 2012...From 2009 to 2011, only two players hit 30+ homers in the season following their rookie year, joining Evan Longoria (33 in 2009) and Giancarlo Stanton (34 in 2011)...Homered in four straight games from May 27-30...Was first Angel to homer in four consecutive team games since Rex Hudler, May 19-22, 1996...Homered five times in six games July 8-17...Logged 27 RBIs in June, falling three shy of club record set by Vladimir Guerrero in June 2004...Connected for six of his 32 home runs against Yankees...Tied a club record for home runs in a single season against New York (also, B. Downing in 1988 & L. Thomas in 1962) - ELIAS...Made multiple starts at five different positions - 16 at 1B, 8 at 3B, 66 in LF, 31 in RF and 22 at DH...Started at five different positions in five straight games from April 19-24 (4/19 - DH, 4/20 - LF, 4/21 - 3B, 4/22 - 1B & 4/24 - RF)...Prior to 2012, played in 12 games in outfield including only one career start...Posted a .980 fielding percentage in outfield. Put together one of the finest rookie seasons in Angels history...Voted by teammates as Angels MVP, just the third Halo rookiebestowed the honor (Bobby Knoop in 1964 & Tim Salmon in 1993)...Also named The Sporting News' A.L. Rookie of the Year (as voted byMLB players and coaches), the Players Choice Oustanding A.L. Rookie(as voted by MLB players) and named to 2011 Topps All-RookieTeam...Batted .254 (137/549) with 65 runs scored, 31 doubles, 29home runs and 87 RBI in 149 games...29 HRs rank second on Angels'all-time rookie HR list (Salmon, 31 in '93)...Finished season one HR& three RBI from being one of just five rookies in the last 25 years with at least 30 HRs & 90 RBI (missed last three gamesof season with a stress fracture in his right foot)...Just third Angel rookie with 25+ HR and 80+RBI (Salmon in '93 & KenHunt in '61)...Led team in HR (29) and RBI (87) becoming first rookie in club history to lead in both categories in aseason...Prior to Trumbo, the last MLB rookies to lead their respective teams in HR and RBI were Jody Gerut of Clevelandin the A.L. in 2003 (22 HR & 75 RBI) and Albert Pujols (37 HR &130 RBI) in the N.L. in 2001...Trumbo led Major Leaguerookies in HRs, RBI, total bases (257) and extra-base hits (61)...Also led A.L. rookies in doubles (31) and slugging pct. (.477)...First rookie since Mike Greenwell (BOS) in 1987 with six games of four or more RBI...First Angel rookie in clubhistory with two walk-off HRs in a season (Aug. 18 vs. Tex. & July 8 vs. Seattle)...Homered in consecutive games fivetimes...Launched 471 ft. HR August 7 off Felix Hernandez, longest at Angel Stadium in 2011...Posted a .993 fieldingpercentage in 149 games played at first base (10 E in 1384 total chances)...Trumbo was one of just three MLB players in2011 whose season HR total exceeded his season walk total (min. 20 home runs)...Other were Vernon Wells (25 HR, 20BB) & Adrian Beltre (32 HRs, 25 BB). Named Angels Minor League Player of the Year...Set career-bests in nearly every offense category during firstseason with triple-A Salt Lake...Batted .301 (160/532) with 29 doubles, five triples, 36 home runs and 122RBI...Led all of minor league baseball with 36 HRs...Also led PCL in RBI (122) and runs scored (103)...36 HRsset a new franchise record...Became fifth player in Bees' history to hit 30+ HRs...Batted .351 (71/202) aftertriple-A All-Star Break to raise average from .270 to .301...Connected for six home runs with 16 RBI over hisfinal nine games with Bees...Named to 2010 PCL Post-Season All-Star team...Recalled by Angels on Sept. 6...Made MLB debut Sept. 11 vs. Seattle, striking out in only plate appearance...Two-RBI single in 9th inningon final day of season (Oct. 3 @ Texas) marked first MLB hit..Made first start Sept. 24 vs. White Sox (at firstbase)...Batted .336 with nine doubles, five home runs, 21 RBI in 28 Venezuelan Winter League games. One of Angels' top power hitting prospects put together solid season in full season jump from single-A todouble-A Arkansas...Batted .291 (155/533) with team-leading 15 home runs and 88 RBI in 137 games...AmongTexas League leaders, ranked third in doubles (33) and fourth in hits (155) and total bases (241)....Struggledover first two months on season (.231, 6 HR, 27 RBI in 45 games) before putting together solid numbers fromJune-September (.319, 9 HR, 61 RBI in 92 games)...Named to Texas League All-Star team. In 2008, spent majority of season with Rancho Cucamonga...Batted .283 with 26 home runs and 68 RBI in 103 games...Was called up to double-A Arkansas on July 28 and went 5-for-5 with two home runs in his first appearance with the Travelers...Helped lead Arkansas to 2008 Texas League Championship...Finished 2008 season with a combined .281 average, leading Angels organization with 32 home runs and 93 RBI...Named to California League Post-Season All-Star team. In 2007, played second season at Cedar Rapids, batting .272 with 14 home runs...Collected a season-best fourhits on April 28 against Lansing...Led club with 128 hits, 76 RBI, 128 games and 471 at-bats. In 2006, spent entire season at Cedar Rapids batting .220 with 13 home runs and 59 RBI in 118 games...Connected for a season-high four hits with one home run and two RBI on June 4 against Burlington. In 2005, began professional career at Orem batting .274 with 10 home runs and 45 RBI...Collected a seasonhighthree hits with two home runs and four RBI on June 23 against Ogden...Tied for Pioneer League lead (withteammate Dallas Morris) in doubles (23) and ranked second in extra-base hits (34). 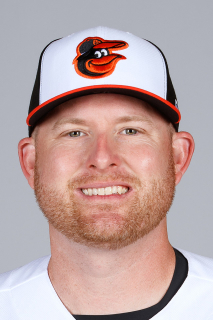 March 25, 2019 Baltimore Orioles placed DH Mark Trumbo on the 60-day injured list. Recovery from right knee surgery. November 2, 2018 Baltimore Orioles activated DH Mark Trumbo from the 60-day injured list. September 11, 2018 Baltimore Orioles transferred DH Mark Trumbo from the 10-day disabled list to the 60-day disabled list. Right knee inflammation. August 20, 2018 Baltimore Orioles placed DH Mark Trumbo on the 10-day disabled list. Right knee inflammation. May 1, 2018 Baltimore Orioles activated DH Mark Trumbo from the 10-day disabled list. April 27, 2018 Baltimore Orioles sent DH Mark Trumbo on a rehab assignment to Norfolk Tides. April 10, 2018 Baltimore Orioles sent DH Mark Trumbo on a rehab assignment to Bowie Baysox. March 29, 2018 Baltimore Orioles placed DH Mark Trumbo on the 10-day disabled list retroactive to March 26, 2018. Right quad strain. August 9, 2017 Baltimore Orioles activated DH Mark Trumbo from the 10-day disabled list. July 31, 2017 Baltimore Orioles placed DH Mark Trumbo on the 10-day disabled list retroactive to July 30, 2017. Right rib cage strain. January 20, 2017 Baltimore Orioles signed free agent DH Mark Trumbo. November 3, 2016 RF Mark Trumbo elected free agency. December 2, 2015 Baltimore Orioles traded C Steve Clevenger to Seattle Mariners for RF Mark Trumbo and LHP C.J. Riefenhauser. June 4, 2015 Seattle Mariners activated RF Mark Trumbo. July 11, 2014 Arizona Diamondbacks activated RF Mark Trumbo from the 15-day disabled list. July 7, 2014 Arizona Diamondbacks sent LF Mark Trumbo on a rehab assignment to Reno Aces. July 1, 2014 Arizona Diamondbacks sent 1B Mark Trumbo on a rehab assignment to AZL D-backs. April 24, 2014 Arizona Diamondbacks placed LF Mark Trumbo on the 15-day disabled list retroactive to April 22, 2014. Stress fracture in left foot. October 8, 2010 Mark Trumbo assigned to Navegantes del Magallanes. September 7, 2010 Los Angeles Angels recalled Mark Trumbo from Salt Lake Bees. March 18, 2010 Los Angeles Angels optioned Mark Trumbo to Salt Lake Bees. October 26, 2009 Mark Trumbo roster status changed by Los Angeles Angels. October 16, 2009 1B Mark Trumbo assigned to Gigantes del Cibao.